communication strategy within the set time frame. Our strategy and business intelligence unit works alongside our clients to help them access strategic and sensitive information, enabling them to gain a competitive edge in their respective areas of concern. In addition to delivering the right message to the target audience, it is important to reach out specific individuals or interest groups within a strict confidentiality framework. we have dedicated considerable time and energy building a competent team of public affairs and lobbying professionals whose vast network and policy experience has proven itself worthy of the trust bestowed upon it time and again. Paris by Patrice Allain-DuprĂŠ and Henri Martre. we strive to provide a unique service tailored to the needs and ambitions of our clients. A dynamic interaction characterizes our relationship with all of our clients. these range from multinationals to government institutions who look to us for strategic counsel, allowing them to make the right decisions. winning over an audience involves creating a relationship of trust. whether it is in conquering a new market or winning an election, Multinational Corporations, International Organizations and Governments rely on us to provide them with in-depth analyses and bespoke reports on a host of subjects. we help them detect the opportunities as well as the challenges that lay ahead. or commercial challenges- enables us to not only monitor the area of interest but also prevent, and if need be resolve, crises. we, therefore, offer a service that is without precedent in Qatar. the Internet is an increasingly important the interest groups that will benefit our clients. the changes that governments and corporations seek to effect. The web plays an ever-expanding role as both an information source and amplifier of debates, concerns and grievances. As such, it exerts increasingly overwhelming influence over the media, decision makers and public opinion at large. Decision makers pay close attention to the general mood of the web and take part in online debates themselves. Decision makers and politicians and their aides go online to collect ideas and gauge opinions. the internet has become a public opinion forum of gargantuan proportion, a development unprecedented in the history of mankind, that can be fostered to highlight the initiatives of governments and corporations, but which can also prove to be their death sentence by multiplaying their exposure. Providing audits, monitoring, preventing and resolving risks. Thought leadership and editorial advocacy. Awareness-raising and community management. Make effective use of the web as a tool of influence to complement or strengthen existing instruments. Implement, evaluate and improve online capabilities for influence or mobilization. Train managers and their teams on emerging issues in the realm of online opinion. Spread convincing and informative messages to help improve understanding or leverage information through strategic information hubs. Create original, viral multimedia content. Organize a dense network of content by modifying the form, angles and arguments according to the platforms/audience. Dilute, nuance and counterbalance negative content. Undertake qualitative, sector based monitoring on targeted web-related issues in an international context (drawing on internal capabilities in English, French, Chinese, Russian and Arabic) with a focus on deciphering accumulated information whilst taking into account local cultural factors and online landscape. Conduct online image audits and progressive mapping of the presence and links between key actors (media outlets, influencers, etc.) and stakeholder communities. Observe the competition and particularly aggressive communities (political extremists, religious fundamentalists, militant activities, etc.) Create, disseminate and promote reports to defend ideas and sustain influence campaigns. Map online networks for pirated content (darknet, streaming, etc.) Define an anti-piracy strategy complete with a range of responses: legal avenues, economic intelligence, influence, lobbying, communications, digital interventions and tactics to confuse and dissuade content pirates. Create and edit a media of reference on a given subject in order to influence online communities. Control a substantial portion of information produced and consulted surrounding a strategic question online. Maximize visibility on search engines and social media. QAtAr’S CANDIDACY fOr uNESCO’S GENErAL DIrECtOrSHIP In light of Qatar’s strong contribution to the United Nation’s Millennium goals and its deep commitment to education, science and culture, ESL&Network is proud to have led the two-year communication campaign of His Excellency Dr. Hamad bin Abdulaziz Al-Kawari in his candidacy for UNESCO directorship. Our campaign’s task force experts envisioned and executed a strategy to target key diplomatic missions with particular emphasis on UNESCO ambassadors; We concurrently operated a long-term digital strategy, through the publication of editorial content on all social media platforms. Our team successfully framed the narrative, notably through the publication of the candidate’s own books and articles in different languages, in accordance with the target audience. EDuCAtE A CHILD (EAC): INtErNAtIONAL COMMuNICAtION AND fuNDrAISING CAMPAIGN EAC is an initiative launched by Her Highness Sheikha Moza bint Nasser of Qatar with the aim of enrolling 10 million children in schools throughout the world by 2016. In 2012, ESL & Network was assigned by the Education Above All Foundation to produce a fully integrated mobilization and communication strategy in order promote its ambitious program Educate A Child. The program aims to trigger significant breakthroughs in providing quality primary education to the 58 million who currently have no access to schooling. ESL Qatar and its partners have developed and executed a Worldwide Communication, Events and Fundraising campaign with High Level Events at the General Assembly in New-York, the World Economic Forum in Davos, UNESCO headquarters in Paris and the World Education Forum in South Korea. Patrice Allain-Dupré, a graduate of IEP (Institute of Political Studies), also holds a Doctorate in Management from the University of Paris and an undergraduate degree in Sociology. From 1978 to 1984 he was Communications and Marketing Director, then Vice-President, at Fnac. Director of Development and Strategy for the Publicis Group, in 1984 he joined the Compagnie Générale d’Electricité as a Member of the Executive Committee and Communication and Marketing Director. In 1987, he became Executive officer for the Compagnie du Midi (AXA), leaving in 1989 to create ESL & Network where he served as Chairman of the Board until the end of 2012. He has taught at the IEP (Institute of Political Studies) in Paris and at the Ecole Polytechnique. He is the author of “Armes secrètes de la décision” (“Secret Weapons for Decision Making”) and “De l’information dans l’entreprise” (“Information in Companies”), and was Administrator of the charity Fondation de France until 2010. Patrice Allain-Dupré is a Knight of the French Legion of Honour. Alexandre Medvedowsky is a graduate of the IEP (Institute of Political Studies) in Paris, holder of a DEA (Diploma of Advanced Studies) in Macroeconomics (Paris 1) and a former student of the Ecole Nationale d’Administration (National School of Administration) (Denis Diderot Class, 1984-1986). He has been a magistrate of the Council of State since 1986 and from 1990 to 1992 served in the cabinet of Laurent Fabius, President of the National Assembly at that time. From 1998 to 2001 he was an associate professor at the University of Aix-Marseille III, and he taught at the IEP in Paris until 2006. He was a councillor of the Bouches-du-Rhône from 1998 to March 2015. He was named a Councillor of State in July 2001 and joined ESL & Network Holding that same year, serving on the Board of Directors. In 2005, he was named President of ESL & Network France. On January 1st, 2013, he was named Chairman of the Board of Directors. Alexandre Medvedowsky is the president of SYNFIE, the French syndicate for economic intelligence. Emmanuel Beth joined ESL & Network as an associate in November 2013. Mr Beth is primarily responsible for developing the office’s activity in relation to Africa. His former roles include Ambassador Extraordinary and Plenipotentiary to Burkina Faso, Director of Cooperation and Security at the Ministry of Foreign Affairs, and Lieutenant General of the Army. He is an expert in the continent of Africa and has led missions to Djibouti, Chad and the Ivory Coast. In 2000, he joined the Office of the Prime Minister at Matignon, serving under Lionel Jospin and later Jean-Pierre Raffarin. He became the Deputy Chief of Staff for the Army, with special responsibility for crisis management, for Africa and for monitoring the Army. Mr Beth was later responsible for strategic planning and joint military operations at the Ministry of Defence before moving in 2006 to the Ministry of Foreign Affairs where he served as Director of Security and Defence Cooperation until 2012. In this role, he was responsible for all French cooperation activities relating to security and defence in over one hundred countries. Dominique Leblanc is a graduate of the HEC Paris business school, the Institut d’Etudes Politiques (IEP) in Paris and the Ecole Nationale d’Administration (ENA, National School of Administration). In 1979 he joined the Ministry of Industry (Department of Mechanical, Metallurgical and Electrical Industries) and, in 1984, the Ministry of Economics and Finance (Department of the Treasury). In 1988 he joined the Société des Bourses Françaises, today known as NYSE-Euronext, as Deputy Director of Products and Operations, later becoming Director of Market Promotion, Vice-President and Deputy Managing Director. In 2001, he became Deputy Managing Director of Viel et Cie, and in 2003, Deputy Managing Director of FinInfo SA. In May 2008 he created the consulting company Information & Finance Agency S.A.S., a member of ESL & Network, specialising in market finance and the valuation of companies, and of which he is the CEO. Dominique Leblanc has served as President of the French Federation of Investment Clubs since 2003, and is President of Wansquare. Aron Shaviv is a “magician” of election campaign. In total, he has helped elect or re-elect 15 presidents worldwide. In terms of major political campaigns, he has worked in a number of countries: Thailand, Cambodia, Romania, Serbia, Kenya, Bulgaria, Guinea, Congo, Egypt, Taiwan, the United Arab Emirates, Spain, Slovakia, Cyprus, Malaysia, Ghana, Ukraine, Estonia, Lithuania, the United Kingdom, Croatia, and Georgia. Araon Shaviv managed Jean- Claude Junker’s campaign to become President of the European Commission and also worked with David Cameron, Prime Minister of the United Kingdom. Since early 2016, Aron Shaviv has advised the Republican Party in the United States and joined Donald Trump’s campaign management team. Among other responsibilities, he oversees outreach to American voters overseas. Arnaud Dassier is a well-known and successful French internet entrepreneur. After a stinit in government, he created one of France’s first Web agencies in 1999. He has advised major companies, ogranizations, and public figures on their digital strategies for over ten years. Arnaud Dassier has notably served as an advisor and campaign manager for the online campaigns of Jacques Chirac (2002), France’s UMP (2005-2007), and Nicholas Sarkozy (2007) Before selling his company to a group listed on the stock exchange. Since then, he has regularly coordinated online advocacy and mobilization projects in France as well as abroad. Matthieu Creux is a specialist in online influence and mobilization. After his studies at Sciences Po Paris, he began his career as a public affairs consultant with EuroRSCG (Havas Worldwide) and later Ernst & Young. He served as an advisor for Internet-related matters at the French Ministry of Higher Education from 2007 to 2009. He has also intervened on behalf of numerous governments and major companies on issues of online activism and counter-activism. Jean-Christophe Bas has a longstanding and well recognized experience in policy dialogue, strategic development and partnerships. As a political consultant, Matthieu Creux has taken part in every French election cycle from 2006 onwards. He has worked on presidential and legislative elections in France, Ireland, Algeria, and Nigeria. In 2014 and 2015, he was the Director of Democratic Citizenship and Participation at the Council of Europe, running a team of 160 staff dedicated to foster democratic competences, participation and citizenship. In 2016, he oversaw the presidential campaign of Denis SassouNguesso in Congo-Brazzaville, where he was charged with organizing the candidateâ&#x20AC;&#x2122;s two largest rallies (the campaignâ&#x20AC;&#x2122;s launch and its conclusion) as well as putting together an independent international observer mission and managing relations with the European press. From 1999 to 2008, he was the Head of Development Policy Dialogue at the World Bank. From 2008 to 2014, he served at United Nations Alliance of Civilizations in New York as deputy Director, Strategic Development and Partnerships. He was also the first Executive Director of the Aspen Institute France (1994-1999), chaired by former French Prime Minister Raymond Barre. 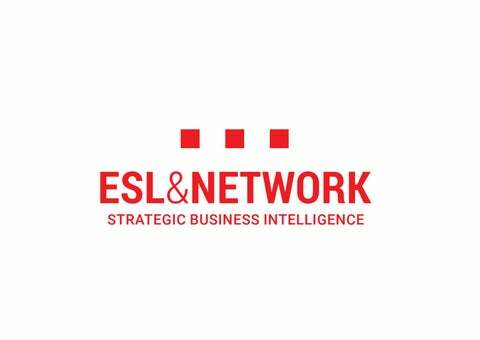 He recently joined ESL&Network as a Senior Advisor, strategic development and partnerships. Jean-Christophe BAS is also the Founder and CEO of The Global Compass, and a member of the Executive Board of the Aspen Institute. Trained journalist and senior executive of large media and communication companies, Franรงois Desnoyers has held several key management positions within both public and private sectors. Expert in brand strategies and management, he supports and advises managers of innovative companies on international projects. He also provides training and coaching to executives and opinion leaders. He was Managing Director at Radio France for 7 years, then at Publicis Events, and managed various companies before joining ESL&Network.